Download "Do not open this paper until instructed by the invigilator. Please note: This question paper must not be removed from the examination room." 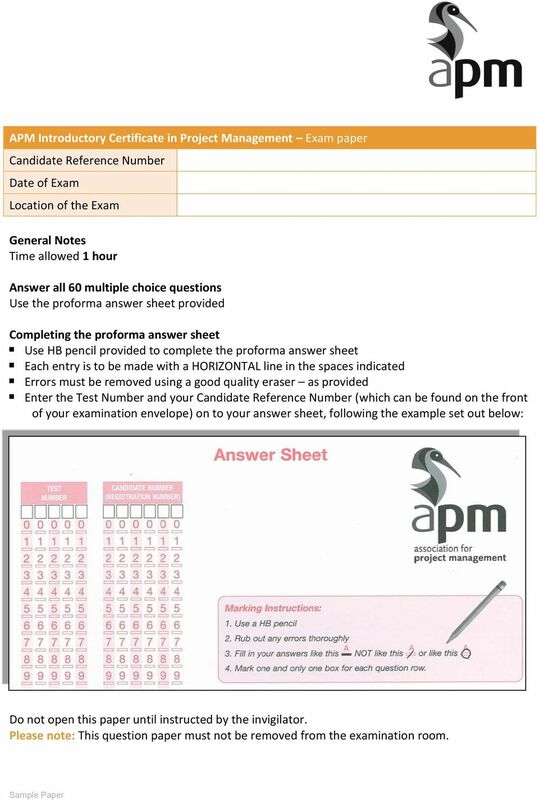 2 2 APM Introductory Certificate in Project Management Exam paper 1. Key performance indicators (KPIs) are used for measuring how a project is progressing towards success and are monitored by project managers: a. at the post-project review. b. not more frequently than monthly. c. throughout the project. d. only when assessing project risk. 2. Which one of the following best characterises a project? a. An ongoing activity to maintain the company plant. b. A transient endeavour carried out to meet specific objectives. c. Continuous improvement of the company procedures. d. Manufacturing components for a new technology. 3. What is meant by the term programme management? a. The management of a group of projects or activities that have a common business aim. b. The line management of a team of programme managers. c. The management of a functional area used by a number of different projects. d. The management of the programme of activities identified in the project plan. 4. A responsibility assignment matrix (RAM) allows the project manager to cross reference: a. the work breakdown structure (WBS) with the organisational breakdown structure (OBS) to match resources to the tasks. b. the organisational breakdown structure (OBS) with the cost breakdown structure (CBS) to assign a cost to each resource. 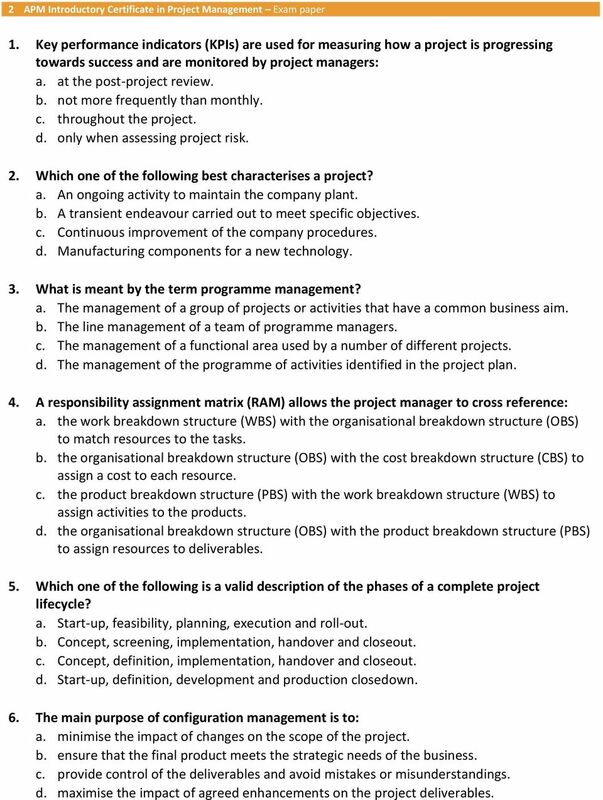 c. the product breakdown structure (PBS) with the work breakdown structure (WBS) to assign activities to the products. d. the organisational breakdown structure (OBS) with the product breakdown structure (PBS) to assign resources to deliverables. 5. Which one of the following is a valid description of the phases of a complete project lifecycle? a. Start-up, feasibility, planning, execution and roll-out. b. Concept, screening, implementation, handover and closeout. c. Concept, definition, implementation, handover and closeout. d. Start-up, definition, development and production closedown. 6. The main purpose of configuration management is to: a. minimise the impact of changes on the scope of the project. b. ensure that the final product meets the strategic needs of the business. c. provide control of the deliverables and avoid mistakes or misunderstandings. d. maximise the impact of agreed enhancements on the project deliverables. 3 APM Introductory Certificate in Project Management Exam paper 3 7. The accuracy of an estimate should: a. decrease as a project progresses through its lifecycle. b. increase as a project progresses through its lifecycle. c. stay constant throughout the project. d. vary independently of where the project is in its lifecycle. 8. What would be the effect if the resources required for a project's critical path activities were insufficient? a. It would reduce the project duration. b. It would extend the project duration. c. The quality of the deliverables would suffer. d. Resource smoothing should be applied to the critical path. 9. Which one of the following is the best description of project scope? a. Scope is detailed in the business case. b. Scope is the total work content of a project. c. Scope is an outcome of the scheduling and estimating processes. d. Scope defines what is NOT delivered by the project. 10. When delivering a project the Project Manager has to balance which one of the following constraints: a. definition and delivery. b. time, cost and quality. c. cost and scope. d. budget, spend and contingency. 11. Which one of the following statements is true? a. Business-as-usual activities cannot be improved. b. Business-as-usual activities are more difficult to manage than projects. c. Projects are transient endeavours that bring about change to business-as-usual. d. A project is always the starting point for operational refinement. 12. What is the purpose of a stakeholder grid? a. A means of stakeholder identification. b. It provides a statement of the stakeholder communications plan. c. To understand a stakeholder s position in relation to the project. d. It presents an action plan for stakeholder management. 13. Which one of the following best describes a programme? a. A group of projects collected together that have a common purpose. b. A group of projects collected together for management convenience. c. A group of projects collected together because of their use of common resources. d. A group of projects collected together because of their relationship to business-as-usual. 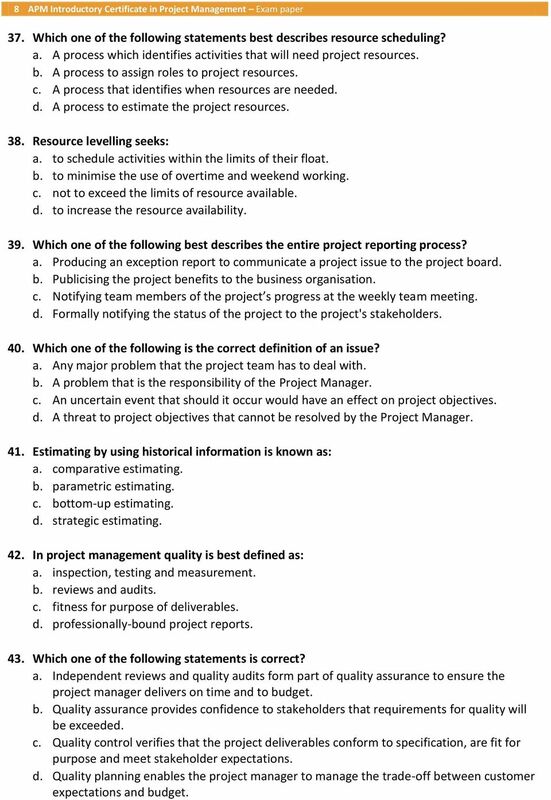 4 4 APM Introductory Certificate in Project Management Exam paper 14. Which one of the following statements is true? a. Risk events always have beneficial effects on the project. b. Risk events can have either beneficial or detrimental effects on the project. c. Risk events always have detrimental effects on the project. d. Risk events have neither beneficial nor detrimental effects on the project. 15. 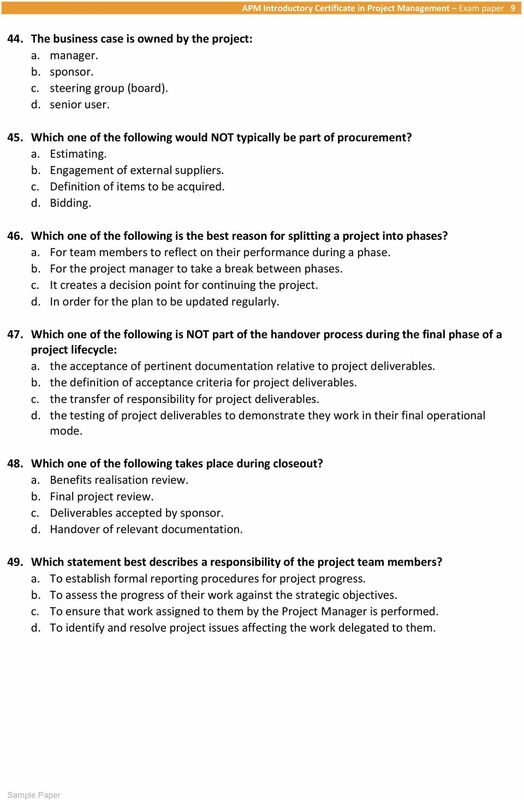 Which one of the following is a generic project management process? a. Risk management. b. Learning and closing. c. Staff appraisal. d. Quality management. 16. Portfolio management could best be described as: a. the co-ordinated management of related projects, including related business-as-usual activities. b. the formal process through which changes to the project plan are approved and introduced. c. the identification of the benefits (of a project or programme) at an organisational level and the tracking and realisation of those benefits. d. the selection and management of all of an organisation's projects, programmes and related business-as-usual activities, taking into account resource constraints. 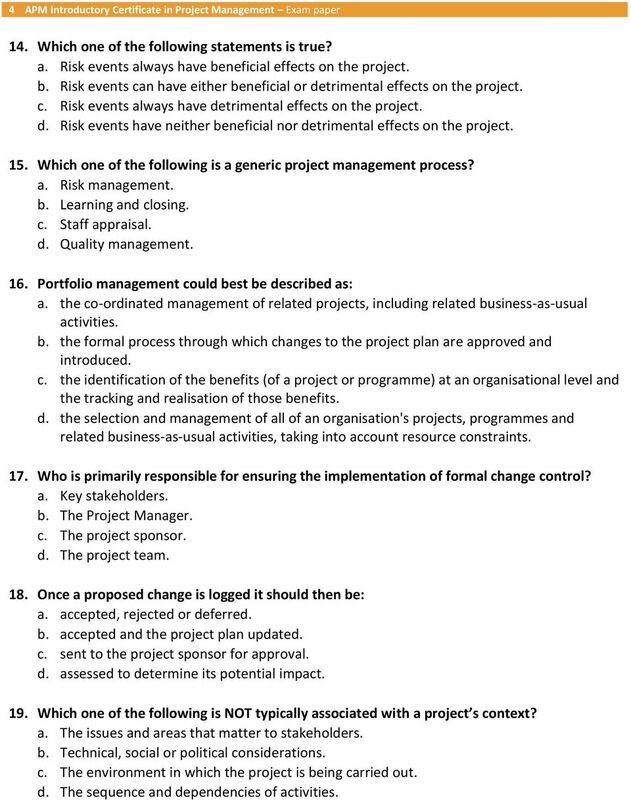 17. Who is primarily responsible for ensuring the implementation of formal change control? a. Key stakeholders. b. The Project Manager. c. The project sponsor. d. The project team. 18. Once a proposed change is logged it should then be: a. accepted, rejected or deferred. b. accepted and the project plan updated. c. sent to the project sponsor for approval. d. assessed to determine its potential impact. 19. Which one of the following is NOT typically associated with a project s context? a. The issues and areas that matter to stakeholders. b. Technical, social or political considerations. c. The environment in which the project is being carried out. d. The sequence and dependencies of activities. 5 APM Introductory Certificate in Project Management Exam paper The total float of activity E in the above diagram is: a. 2 b. 1 c. 0 d The primary purpose of a product breakdown structure (PBS) is to: a. define all the products that the project will produce. b. define precisely what resources will be used on the project. c. detail all the products in order of priority. d. map out the key project elements identified in the business plan. 22. 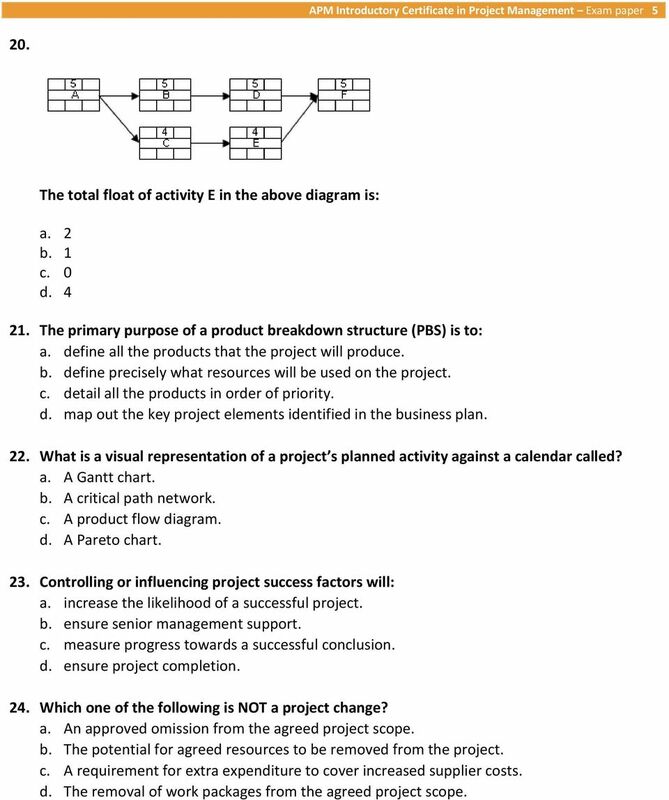 What is a visual representation of a project s planned activity against a calendar called? a. A Gantt chart. b. A critical path network. c. A product flow diagram. d. A Pareto chart. 23. Controlling or influencing project success factors will: a. increase the likelihood of a successful project. b. ensure senior management support. c. measure progress towards a successful conclusion. d. ensure project completion. 24. Which one of the following is NOT a project change? a. An approved omission from the agreed project scope. b. The potential for agreed resources to be removed from the project. c. A requirement for extra expenditure to cover increased supplier costs. d. The removal of work packages from the agreed project scope. 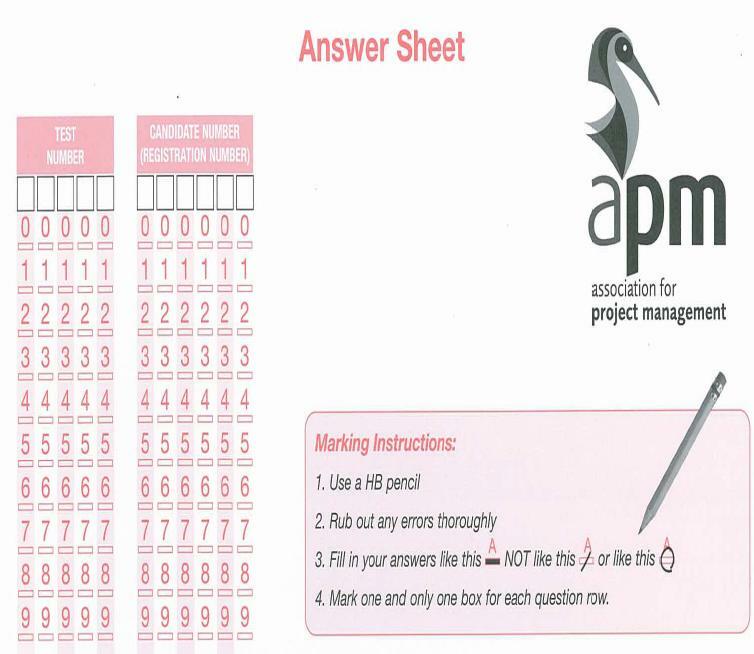 6 6 APM Introductory Certificate in Project Management Exam paper 25. Which one of the following best describes project sponsorship? a. Project sponsorship is the customer s role responsible for identifying the business need. b. Project sponsorship is an active, senior management role responsible for identifying the business need, problem or opportunity. c. Project sponsorship is an active, senior management role managing the customer s needs subject to an agreed cost. d. Project sponsorship is the project manager's role responsible for delivering the business need and addressing any problems or opportunities. 26. Project success criteria are best defined as: a. the qualitative or quantitative measures by which the success of the project is judged. b. the factors that, when present in the project are most conducive to a successful outcome. c. the measures that establish if project activities are ahead or behind schedule. d. the activities or elements of the project which are considered to be critical to success. 27. Which one of the following best describes stakeholders? a. Anyone who has heard about the project. b. Anyone who has an opinion about how the project should be managed. c. People wanting to be members of the project team. d. People who are affected by the project in some way. 28. The project management plan is best described as a reference document that confirms: a. the project completion date as agreed between the project sponsor, other stakeholders and the project manager. b. the agreement between the project sponsor, other stakeholders and the project manager. c. the key project milestones as agreed between the project sponsor, other stakeholders and the project manager. d. the project start date as agreed between the project sponsor, other stakeholders and the project manager. 29. The value of a risk log lies in its ability to provide: a. a record of all risks, their impact and the actions taken to manage them. b. a record of the ownership of risk and issue management actions. c. a means of assessing the likelihood and impact of risks. d. a structured process for risk management. 30. Which one of the following statements best defines a portfolio? a. A group of related projects, which may include business-as-usual activities, that delivers change. b. A timetable of how project activities and project milestones are planned over a period of time. c. A group of projects that represent the delivery of all, or a discrete part of a new capability. d. A grouping of an organisation s projects, programmes and related business-as-usual activities. 8 8 APM Introductory Certificate in Project Management Exam paper 37. Which one of the following statements best describes resource scheduling? a. A process which identifies activities that will need project resources. b. A process to assign roles to project resources. c. A process that identifies when resources are needed. d. A process to estimate the project resources. 38. Resource levelling seeks: a. to schedule activities within the limits of their float. b. to minimise the use of overtime and weekend working. c. not to exceed the limits of resource available. d. to increase the resource availability. 39. Which one of the following best describes the entire project reporting process? a. Producing an exception report to communicate a project issue to the project board. b. Publicising the project benefits to the business organisation. c. Notifying team members of the project s progress at the weekly team meeting. d. Formally notifying the status of the project to the project's stakeholders. 40. Which one of the following is the correct definition of an issue? a. Any major problem that the project team has to deal with. b. A problem that is the responsibility of the Project Manager. c. An uncertain event that should it occur would have an effect on project objectives. 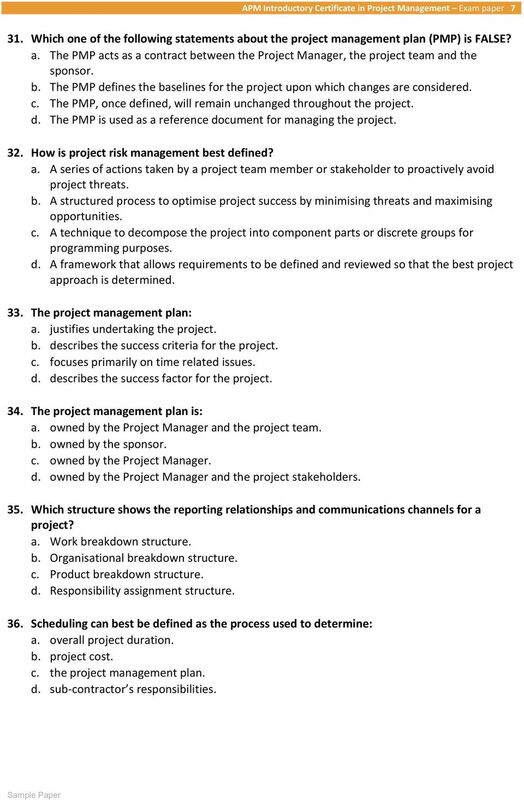 d. A threat to project objectives that cannot be resolved by the Project Manager. 41. 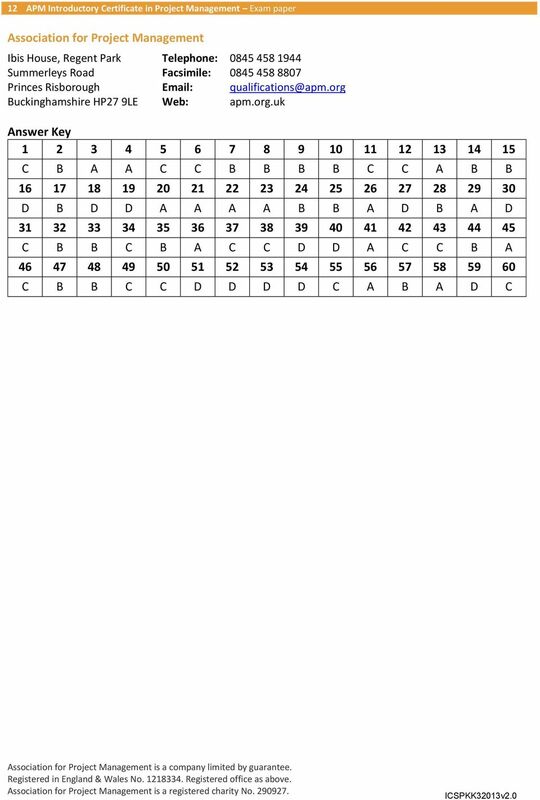 Estimating by using historical information is known as: a. comparative estimating. b. parametric estimating. c. bottom-up estimating. d. strategic estimating. 42. In project management quality is best defined as: a. inspection, testing and measurement. b. reviews and audits. c. fitness for purpose of deliverables. d. professionally-bound project reports. 43. Which one of the following statements is correct? a. Independent reviews and quality audits form part of quality assurance to ensure the project manager delivers on time and to budget. b. Quality assurance provides confidence to stakeholders that requirements for quality will be exceeded. c. Quality control verifies that the project deliverables conform to specification, are fit for purpose and meet stakeholder expectations. d. Quality planning enables the project manager to manage the trade-off between customer expectations and budget. 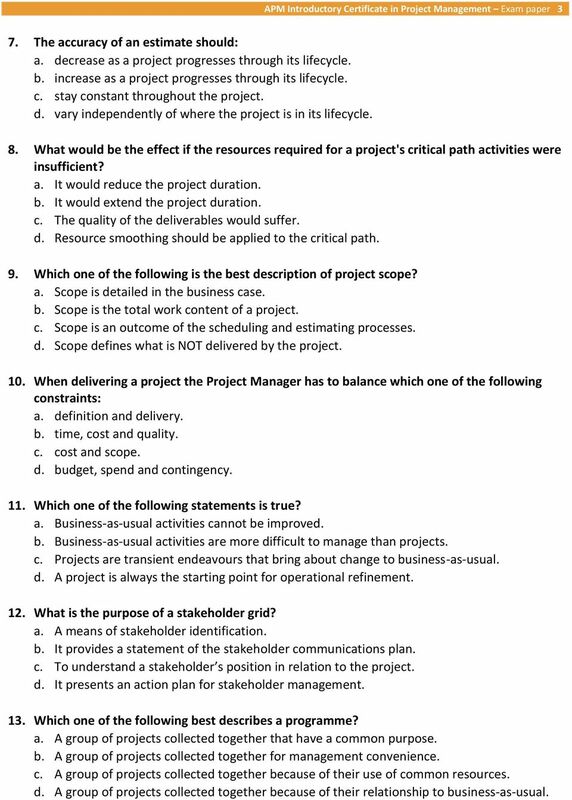 10 10 APM Introductory Certificate in Project Management Exam paper 50. The role of a leader includes: a. effectively managing risks. b. selecting the project team. c. coaching and mentoring project staff. d. producing accurate project reports. 51. The primary purpose of a gate review is to decide: a. whether the project manager and team are performing well. b. if the project is on schedule and within budget. c. if stakeholders are satisfied. d. whether to continue with the project. 52. The primary purpose of the post-project review is to: a. find out who was responsible for problems on the project and why. b. find out whether the business benefits were achieved and why. c. find out who performed well on the project in order to support future resource allocations. d. identify lessons learned to enable continuous improvement. 53. The project manager s prime responsibility is to: a. deliver the benefits. b. define the requirements. c. sign off the business case. d. implement the project plan. 54. 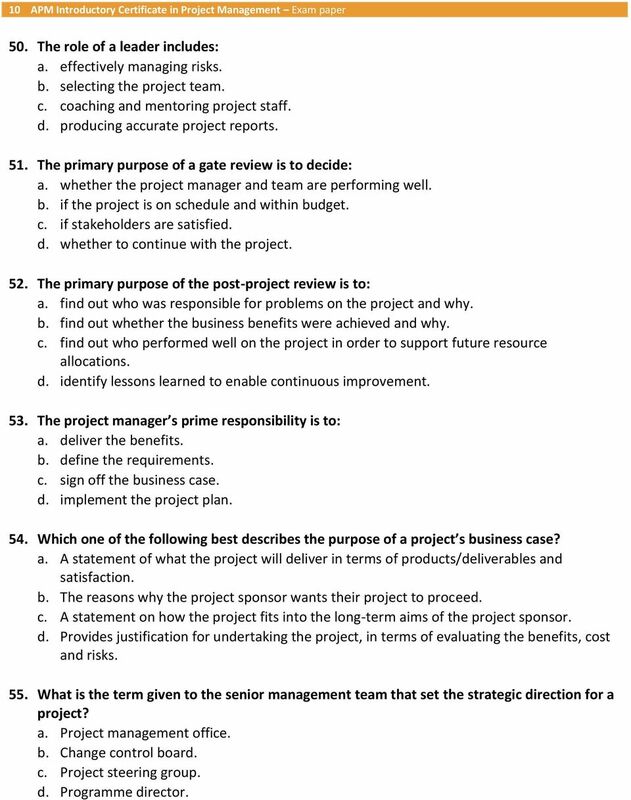 Which one of the following best describes the purpose of a project s business case? a. A statement of what the project will deliver in terms of products/deliverables and satisfaction. b. The reasons why the project sponsor wants their project to proceed. c. A statement on how the project fits into the long-term aims of the project sponsor. d. Provides justification for undertaking the project, in terms of evaluating the benefits, cost and risks. 55. What is the term given to the senior management team that set the strategic direction for a project? a. Project management office. b. Change control board. c. Project steering group. d. Programme director. 2nd Edition Introductory Certificate Syllabus Introductory Certificate 2nd Edition Introductory Certificate syllabus All of the syllabus elements should be taken within the context of a project and project. 20 PMP Live Questions and Answers! Project Services. How do we do it? End-to-end project delivery framework Introduction This document outlines end-to-end project mechanisms, including key activities, stage gates, templates, governance, and tools for monitoring and controls.